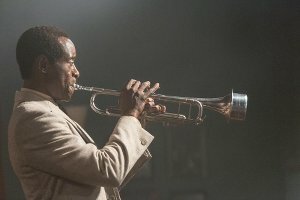 Don Cheadle’s Miles Ahead — a foray into the turbulent world of jazz great Miles Davis — tries to match Davis’ musical inventiveness with a style that moves like jazz, stating a theme, then following it in one direction or another. For much of the movie, Davis is not in a good place. From 1975 to early 1980, he didn’t play his trumpet. Instead, he holed up in his New York home, doing drugs, drinking, smoking cigarettes and punching a heavy bag. Cheadle — who co-wrote the script with Steven Baigelman — may have been trying to be worthy of Davis, who at one point in the movie says that if you’re going to do something, it’s best to do it with attitude. Cheadle, who directed, follows suit: He brings a ton of attitude to his movie — and to his performance as Davis. Davis does everything to keep the rest of the characters off balance. During a time when he wasn’t doing anything musically, Davis still knew how to flex his muscles. He’s on guard, perhaps a bit paranoid. He’s wary of those who try to invade his isolation. The movie doesn’t always stay within the five years before Davis’ so-called comeback, a term Davis evidently hated. Comeback? He felt he hadn’t gone anywhere. Cheadle sometimes flashes back to Davis’ romance with Frances Taylor (Emayatzy Corinealdi), a dancer whom Davis courted, married and ultimately alienated. As Cheadle sees it, Frances was the love Davis never quite got over. For all its inventiveness, Miles Ahead can’t resist burdening itself with a plot. A journalist (Ewan McGregor) tries to weasel his way into Davis’ world, claiming that he’s writing an article for Rolling Stone. McGregor’s Dave Brill winds up joining Davis as he makes his various rounds. Eventually, they conduct a manic search for session tapes that have fallen into the hands of Harper Hamilton (Michael Stuhlbarg), an unscrupulous promoter who carries the burden of representing everything that’s loathsome about the music business. Davis’ attempts to retrieve his tapes produces mixed results for the movie. On one hand, Cheadle explores Davis’ necessary rage. The idea that someone could own his music — his expression — seems outrageous to Davis, a painful reminder of the way many musicians are treated by an industry that turns them into commodities — or at least often tries to. The movie also effectively shows that Davis had no interest in repeating the music that made him famous in albums such as Birth of the Cool, Sketches of Spain, Round Midnight, Kind of Blue and more. He knew that when exploration dies, so does art. But this part of the movie also produces hackneyed results, including a car chase and a scene in which Brill procures cocaine for Davis from a student at Columbia University. There are only so many scenes of Davis, smoking, drinking and snorting coke that any movie needs, and the wanderings of Brill and Davis, though somewhat antic in flavor, go nowhere. Miles Ahead isn’t really a bio-pic; I saw it as an attempt to show us what it might have been like to be in Davis’ company, to get caught up in one of his self-destructive whirlwinds before he lands on the other side of chaos. McGregor’s character serves as the audience’s surrogate in this regard; he never can entirely relax around Davis — not only because he usually wants something from Davis, but because Davis intends to keep him off guard. Cheadles’ Davis is an artist of edgy integrity. Many people want a piece of him, but nobody gets close enough to take one.